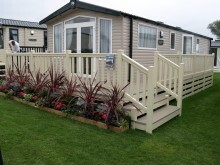 Fensys manufacture and supply UPVC caravan decking components designed to complement and match the high aesthetic quality of today’s static caravans. Recognising the need to keep pace with our caravan design partners, Fensys work along side the industry to ensure we have the product to best suit your new holiday home. Fensys also offer a fully galvanised metal sub-frame system, so your UPVC deck can sit on the same steel type base as your caravan. An alternative and warming terminology, the caravan sundeck title exudes all the promise of a warm summer’s day and the relaxation that awaits you. 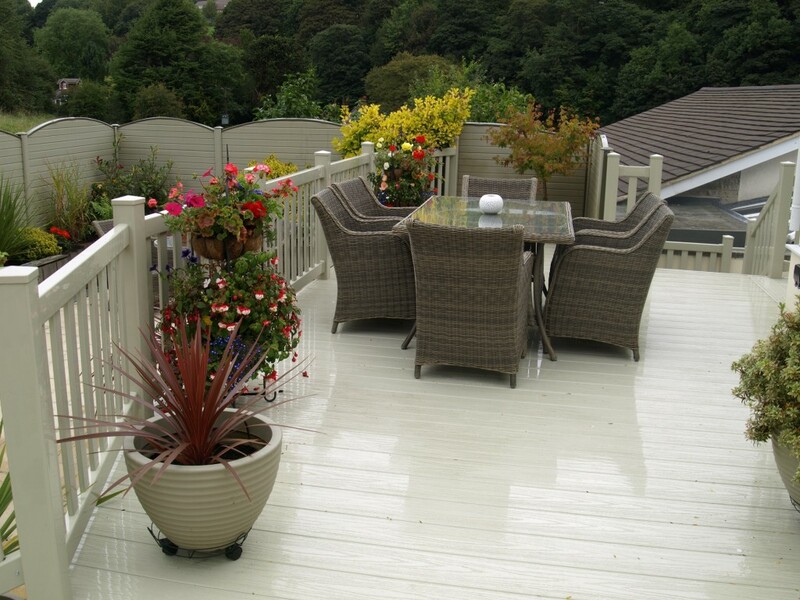 The Fensys range of outdoor plastic decking components is specifically engineered to meet your needs for many years of untroubled enjoyment. Fensys use the most advanced engineering grade plastics available, we also offer galvanised reinforcement for posts and hand rails, so no matter how many hours of sunlight you get to enjoy you can rest easy in the knowledge that your Fensys veranda is designed to resist the elements. The design and luxury of modern caravans has transcended the title ‘static caravan’ leading manufacturers to use the much more appealing title of ‘Holiday Home’. 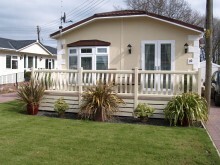 Modern holiday homes are available in a variety of styles with many cladding and window finishes. The Fensys range of holiday home decks and verandas can be purchased matching and or complimenting no matter what home you have. Standard balustrade colours include white, cream and beige, and we also offer window matching embossed finishes dark green, golden oak, rustic oak and dark grey. 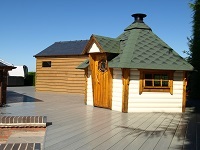 Many lodge manufacturers now offer units designed to last for 50 years or more, these units meet all of the commercial specifications required to achieve this. 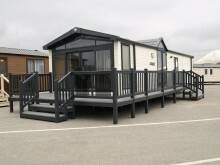 Matching the performance of these lodges and park homes, Fensys materials have been tested to commercial standards for slip resistance, structural load bearing and strength of balustrade, making sure your Fensys outdoor living space is safe and will last the test of time. For your safety, all Fensys polymer products are produced from non-flammable self extinguishing plastics. 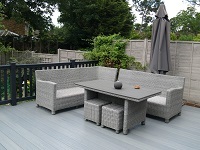 Recognising the advantages of our decking products in terms of weather resistance and modern aesthetics, many customers are opting for an enhanced outdoor living space at home. A Fensys luxury home garden deck complete with the option of a fully galvanised metal sub-frame offers an outdoor living space like no other. 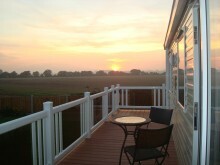 An extra room in the garden that can be used in all but the most unsavoury weather conditions. 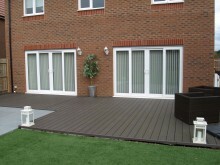 The use of modern earth tone colours and our advanced manufacturing methods enable us to offer a suitable deck board to compliment any home. A 100% polymer board produced with an advanced engineering grade thermoplastic cap layer giving exceptional weatherability. This board combines multi colour processing technology and a dual wood grain patterning to give excellent slip resistance as well as a great appearance. Whilst the robust tongue and groove design of these boards provides superior strength the boards are manufactured from a partially recycled plastic base layer giving them green credentials. Our Natural Wood Plastic Composite or WPC deck board has a wood grained patterned side and a more traditional lined side. 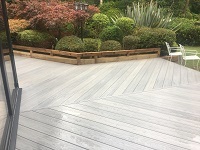 Manufactured using a 60% wood 40% polymer mix, this double sided board offers greater resistance to rotting and is more slip resistant than wood whilst retaining a natural appearance that will age and fade gracefully but needs no preservative treatment, staining or coating. Available in Charcoal Black and Cedar Brown the boards are pre-sanded to further enhance the natural look. 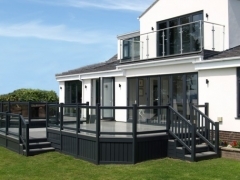 Tested to modern building regulations the Fensys range of UPVC plastic decking materials can be used with confidence what ever the application. 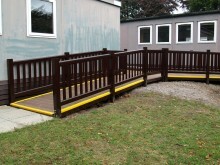 Just a few examples are outdoor school class rooms, business meeting areas, restaurant dinning area’s, commercial or residential balconies, wheel chair ramps, fishing pontoons, and boat jetties. Whether you are looking for a relaxing space at work, an entertainment or dinning area or any other practical commercial application, the versatility of the Fensys decking system ensures that we can deliver on customer expectations and create an engaging solution. 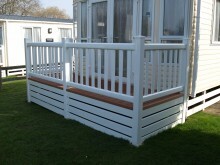 Complementing our Fensys range of decking and balustrade products, we also manufacture and supply cladding solutions for your deck and or holiday home. Whether it is for appearance, insulation or just to keep the dog out, Fensys offer solid, solid vented, ranch and panel skirting types. More information and images of the Fensys range can be found by downloading literature or by viewing our gallery pages.